Author Jennifer Shirk's Me, My Muse and I: Best Christmas Gift! Oh, hi. Are you still here? No end of the world, I guess. Well, I thought FOR SURE the end was near on Monday. 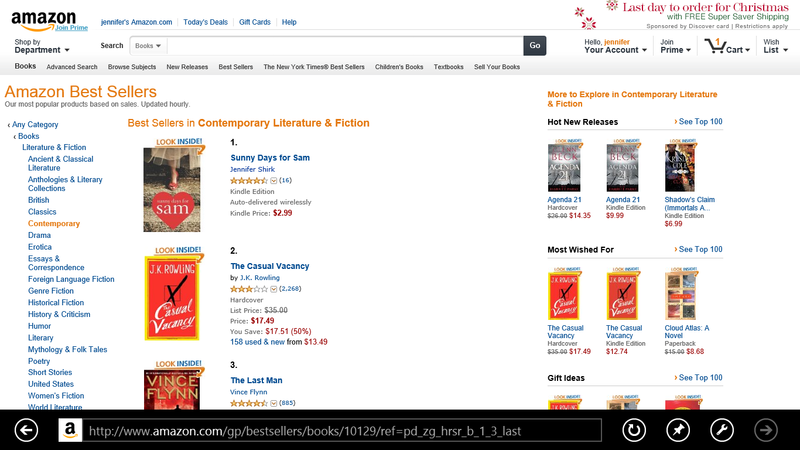 I mentioned that Amazon decided to make my book SUNNY DAYS FOR SAM a Kindle Daily Deal on my blog. I actually had to find out through seeing someone tweet about it. When I saw it I was like, "Sunny Days... Hey, that's MY book!" So I went over to Amazon and sure enough the price was lowered to 99 cents for that day only. So I figured I'd go with it and tell everyone. 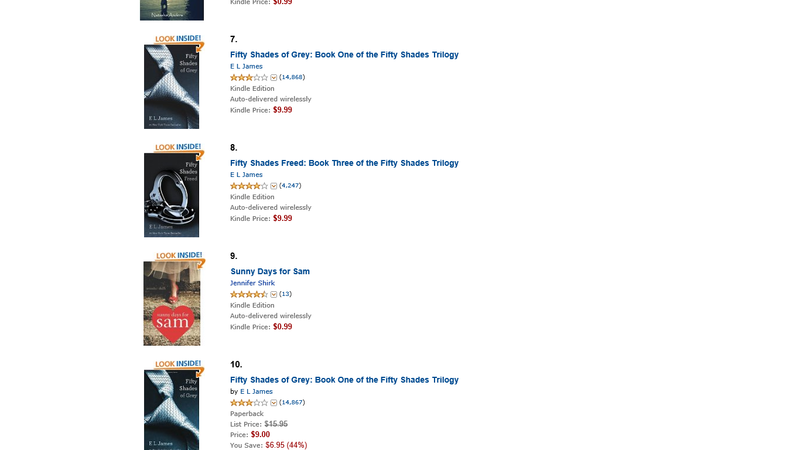 I ended the day as #16 for Best Sellers overall, #1 for Contemporary fiction, and #5 for Contemporary romance! THANK YOU to those who bought! THAT was so fun to see! Look at my sweet little PG romance wedged between all those 50 Shades books! But it was fun while it lasted, and a nice unexpected gift to receive! On another note, I am DONE shopping and wrapping. I'm still baking cookies and need to make two pies, but that's fun stuff. I'm pretty much on cruise control until Christmas. So how about you? Where are you in your Christmas prepping? Shopping done, gifts to be wrapped on Saturday along with making homemade ravioli for Christmas dinner, and baking some cookies. That is one excellent Christmas present. That's incredible! Congrats. You got an early Christmas present. Oh Jennifer, I LOVE seeing that for you! Congratulations & Merry Christmas! Awwwww what a brilliant way to start the festivities!! Congrats on the sales of your book!! Well done you!! Wooo Hooo!! 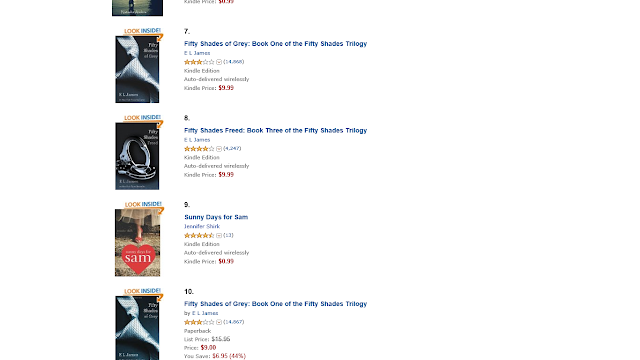 You beat out JK AND 50 shades. How totally exciting. Congrats to you. Have a very merry Christmas! Oh, how awesome about your book sitting at number one... if only for a little while. Kinda like an early Christmas present for you. By golly, I think we are ready for Christmas. Unbelievable. Good thing, though, because we'll be packing it all up and heading to our son's tomorrow. Woo Hoo! That is too cool, Jen. Wow, Jennifer! That's super-duper marvelous! I would read your books over Fifty Shades any day. Hi, Jennifer! CONGRATS on the book stats. Awesome! Perhaps I'll get some cookies baked today? LOL! That's SO great, Jennifer! Here's to you shaking up the 50 Shades crowd with your sweet book. I love it!